Heloise isn't your typical suburban mother. Her life has never been easy. Raised by an abusive father and a mother who chose her father over her time and time again, she ran away for love, hoping to escape, only to find herself in one bad situation after another. Her name was Helen then. When she became pregnant, she took it upon herself to pull herself out of a very bad situation. She renamed herself Heloise and started over. Heloise is very careful about keeping her personal life separate from her business life. As a madam, she has to. When news of the death of another madam working and living in a neighboring county makes the news, Heloise takes note, but isn't overly worried. Then news about her son's father possibly getting out of prison, reaches her--a dangerous prospect, especially since he doesn't know about their son. As events unfold and Heloise discovers a connection between her and the dead madam, however, she finds she must re-evaluate her business--and her life. The safety of her son and of herself is in jeopardy. 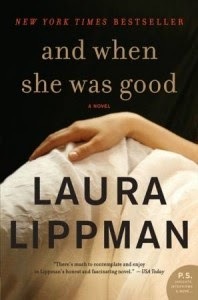 Laura Lippman is an extremely talented writer. And When She Was Good is a riveting story of one woman's struggle to overcome adversity and a past that won't let go. I am not sure I ever really liked Heloise, at least not in the way I would come to like a friend. I came to respect her though, even if I didn't always agree with the choices she'd made. She isn't the warmest of persons. Heloise is calculating and careful in all she does. She does not allow herself to get close to anyone. My heart ached for the younger version of Heloise, and for the life she suffered. She was forced to make difficult choices, victimized by those who take advantage of girls who see no other way out of their situations. As the story progressed, it was easy to see how Helen evolved into Heloise. And When She Was Good is less a plot driven thriller and more of a character driven one. The more we learn about Helen of the past, the more we learn about Heloise in the present. Both stories are told in alternating chapters, coming together seamlessly. This isn't a fast-paced book. The author takes her time introducing Heloise and letting the reader into her life. I didn't mind. I was drawn into Heloise's world through Laura Lippman's words. To learn more about Laura Lippman and her books, please visit the author's website. You can also learn more about the author by visiting her Facebook page. I hope you will check out what others had to say about And When She was Good on the TLC Book Tours route! Many thanks to the TLC Book Tours for the opportunity to be a part of this book tour. I read an e-copy version of this book which I purchased for my own reading pleasure. I've enjoyed a couple of Lippman's books. This one sounds interesting. Jenclair - This one was different, but I enjoyed it. I think I expected a bit more action going in, but I wasn't disappointed. Sounds promising though I do have my concerns about the story being told in this way even if it is seamlessly done. Tracy - It really was easy to follow the story. The author brings everything together nicely. Dare I add yet another book to my wishlist? Ack! It just keeps growing and growing but I can't help it :) Thanks for another great review! Jennifer - As if we don't already have enough books on our wish lists! I haven't read Lippman for a while but have always enjoyed her books. Kathy - It'd been a long while since I last read a book by her as well. I've only read a couple of her books but definitely will go back for more. This one sounds very different from her other books I think. Interesting. Iliana - Yes, I definitely want to read more by the author. Helen/Heloise has certainly had a difficult life ... I can't imagine being in her shoes. Heather - Yes, she has. I couldn't help but feel bad for her. I really like this author so this one sounds like a book I would enjoy so much! Staci - Me too! I hope you get a chance to read it. I like more a plot probably, but this does look good. Stacy - I think there's enough of a plot here to keep a reader interested. There's a lot of back story which comes into play in the present in the end.